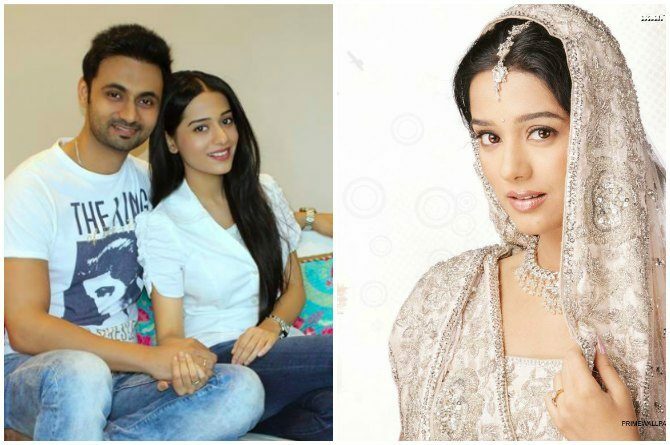 Vivaah actress Amrita Rao got married to her long-time boyfriend RJ Anmol in an extremely private ceremony in her residence in Mumbai on Sunday, May 15. While the actress and her family have surprisingly not issued an official statement so far and have managed to keep the wedding a hush-hush affair, Radio Jockey Anmol posted this adorable picture of the couple on his FB fan page yesterday. Anmol wrote in The FB post that the nuptials took place on Sunday and said: "An interview that started seven years back, continues...Only to get stronger today! Just married! Amrita and I need your good wishes." The couple have been dating for seven years now and while Amrita has kept the relationship under wraps, there were reports that the actress had moved into Anmol's flat this February. Interestingly, as stated by Anmol the couple met and fell in love after he had invited the actress to his radio show :). Amrita is the fourth Bollywood actress to get married this year after Urmila Matondkar, Preity Zinta and Bipasha Basu. While Bipasha Basu got married lavishly in traditional Bengali style, Urmila and Preity had also chosen to wed in low-key ceremonies just like Amrita. Amrita Rao has been a fairly popular actress in Bollywood and is remembered for her roles in the movies Vivah, Ishq Vishq, Satyagraha, Main Hoon Naa and Shaurya. She is currently working in the popular TV series Meri Awaaz Hee Pehchaan Hai, which is based on the the story of Lata Mangeshkar and Asha Bhonsle. Her husband Anmol belongs to the city of Delhi and works for hails Radio Nasha ( 91.9fm- Mumbai & 107.2fm- Delhi...owned by Hindustan Times group). He also hosted the popular show Purani Jeans with RJ Anmol that had a major fan following and was one of the best radio shows of that time. It's official: THIS is India's most polluted city!